Eleven years ago, DH and I bought our first house. He had a small townhouse that housed our first two years of wedded bliss, but this was our first place together and our first grown-up house. Our own walls that didn’t touch anybody else’s walls, our own driveway, our own fence. It was, at the time, a pit of a kitchen. Stained Formica countertops with a big burn mark next to the sink, a stained and torn linoleum floor, and rough-textured cabinets that were too awful to describe. But it was my kitchen, and I settled in almost immediately (weeks before we started living there), filling the built-in spice rack with little jars, choosing which drawer (of the whole three) would hold silverware, and picking out a space on that tired counter for our coffeepot. We’d been in the little house for a few months when my mom showed up with a housewarming gift. A perfect, white, KitchenAid mixer with a perfect stainless steel bowl and perfect attachments, that fit perfectly into the corner, atop that old counter, between the stove and the sink. It belonged there. And it really was the spark that kicked off my truly learning to cook. A major kitchen renovation, 11 years, and a move around the corner later, my beloved KitchenAid is still my favorite toy. With only the attachments it came with (the dough hook is a thing of wonder for those of us who aren’t joyful kneaders) and an extra steel bowl, it works magic almost every day. Breads and cookies and doughs and mashed potatoes and corn pudding and anything you can imagine emerge from beneath its beater, usually with an excited child hoisting herself up on her tippy-toes at the edge of the counter so her nose can poke over the top and she can see what delights are held within. My mixer never stalls. It never clogs. It just whirs along happily, doing whatever I ask of it with nary a complaint. As far as I’m concerned, the KitchenAid stand mixer is worth every last dime and every inch of counter space it demands, even when resources and space are limited. Life is easier and a lot more fun with my baby over there, next to my canisters of flour and sugar and chips, and I am a happier cooking mama because of it. What’s your favorite kitchen toy? Same as mine, or something different? Leave me a comment and let me know–I’m always looking for my next happy kitchen investment! And yes, she’s flamed out. DH did it for me with decals from Pep Boys. Tell me he doesn’t rock too! 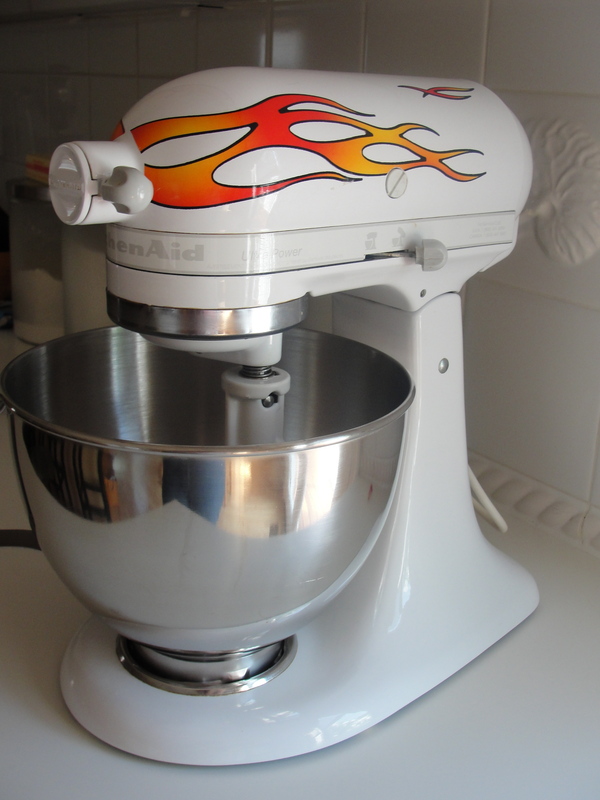 My KitchenAid Mixer is my favorite, too!! It’s starting to go on the fritz – stutter starting when it’s in the “off” position so that I have to unplug it, but I won’t buy a new one. Not yet anyway. I got mine as a wedding gift and it’s awesome – best present! I agree about the Kitchen Aid mixer, but I think my best purchase was my Black & Decker griddle (circa 1994). I’ve had it for 16 years, it cost me about $20, and I use it pretty much every weekend. I can make 10+ pancakes at once and with four kids and countless “surrogate kids” at my house every weekend, I don’t know what I would do without it. What I really want?? A good chefs’ knife. I have 1 single cutco knife that I love, but it’s just a carver…so no clearance for chopping or anything…Some day….